When you think of waves, you usually think of the ocean: surfing on the water as it curls towards the shore. However, waves describe a variety of different things, such as light, radiation, sound, and movement. In fact, we could not see, hear, or move if waves did not exist. There are characteristics found in every type of wave. An entire wave includes one movement up to the crest and one movement down to the trough. Waves can be measured using wavelength and amplitude which describe the length and the height of the wave. 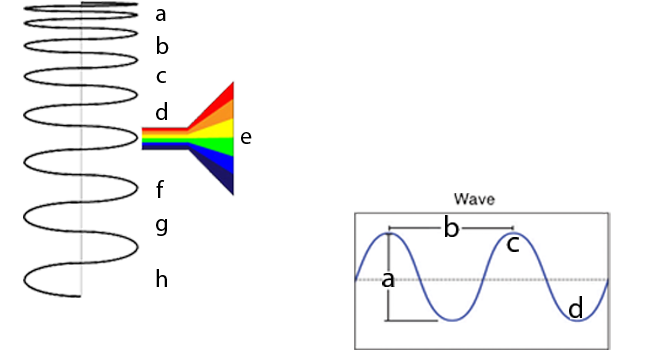 Light travels through waves in what is called the light spectrum. Every color has different measurements and characteristics. Sound waves determine volume and pitch for everything we hear. Explore the nature and role of waves that exist in our world. Ride the wave! Draw the waves as shown on this page. Fill in the blanks (a, b, c, d,e, f, g, h) on each chart using wave vocabulary you have learned. Use the explore links to find more information about wave terms. Next, fill in the terms for the wave light spectrum. Fill a bucket or wide tray with water. Place a fan near the bucket so that it blows on the surface of the water. Observe the resulting ripples. Draw what you see. Next, place another fan between 30 and 90 degrees around the bucket from the first fan. Watch the ripples created from each fan as they collide with one another. This is called interference. To make waves, you will need a small aquarium tank or clear container of similar shape and size, a cork, a small block of wood and masking tape. Fill the tank with water and place the cork in the center. Use the tape to mark the approximate location of the cork on each side of the container. At one end of the tank gently lower and raise a small wooden block in and out of the water to create waves. How and where did the cork move? Energy, in the form of waves, moves across the cork but the cork itself (and the water) moves in a circular motion. 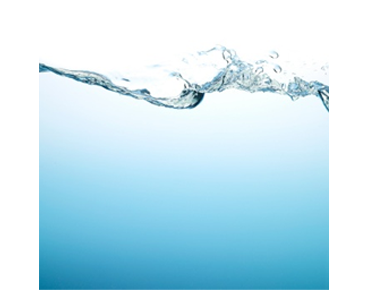 Activity 4 – Capture a Wave! Many artists have painted seaside and ocean scenes. Research artists who have drawn, printed or painted waves. Sometimes waves were part of a stage set design like in Where the Wild Things Are by Maurice Sendak. 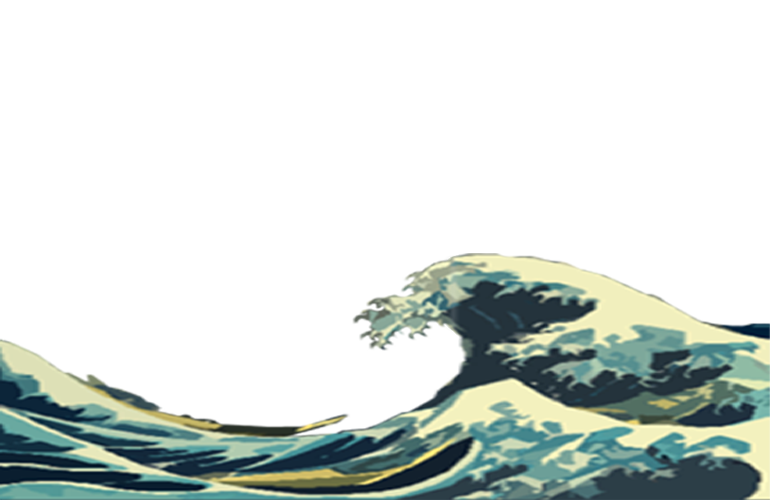 One of the most famous waves is The Great Wave off Kanagawa. 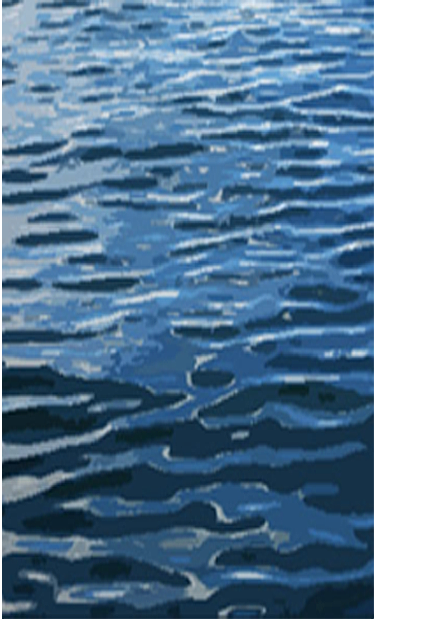 Look at the colors of water and froth in this painting. Create sketches of waves. Use the sketches to inform paintings of waves. Experiment with water color and other media. Waves can only be found in water, sound, and light. Which is a measurement for waves? What is it called when two waves hit each other? Which does NOT have to do with waves? Which kind of light is NOT found on the light spectrum?